Aim: The aim of this study was to assess the oral hygiene awareness among orthodontic patients. Objective: This research aims to find if patients undergoing orthodontic treatment are aware of the probable accumulation of dental plaque and the consequences of it, namely, bad breath, gum disease, and dental decay. Materials and Methods: The study was conducted on orthodontic patients from the Department of Orthodontics in Saveetha University. A self-assessed questionnaire was formulated to assess the oral hygiene awareness among orthodontic patients. The questionnaire was pretested to assess its reliability. It was distributed to 100 patients and only completely filled questionnaires were taken for analysis. Results: An average of 44% of the population are aware of the oral hygiene measures. The female population who underwent orthodontic treatment was more aware of the oral hygiene measures compared to men. Conclusion: There is a need to incorporate more oral hygiene programs in future. Extra attention should be given in educating and motivating the patients on oral hygiene practices during orthodontic treatment in a proper manner, which will be helpful to the patients in maintaining their oral hygiene. Good oral hygiene is a key factor required to facilitate uninterrupted orthodontic treatment. Numerous studies show a significant increase in the quantity of dental plaque as well as the occurrence of gingivitis in patients with fixed orthodontic appliances because they make removal of dental plaque difficult. The fixed orthodontic appliances such as braces, arches, and rings increase the number of retention places for dental plaque accumulation. All these factors make it even more difficult to maintain oral hygiene. Self-cleansing is also more difficult because of the reduced effect of mechanical chewing and cleansing effect of saliva on food residues. The lack of good oral health can lead to plaque accumulation, gingivitis, tooth decay, and periodontitis, which can prolong or may lead to discontinuation of orthodontic treatment. Information should be provided about oral hygiene techniques and this has to be strictly followed by the patients. Awareness alone is not enough to achieve good oral health unless the target population practices it meticulously. Although imparting oral health education begins from the footsteps of awareness, evaluation of its implementation is an important indicator of the success of the education imparted. The information gathered from a certified university serving across a multicultural area of Chennai and servicing patients across various socioeconomic groups would be vital in providing information regarding the oral hygiene in orthodontic patients. Such information would be valuable in formulating dental screening programs aimed at decreasing the incidence and prevention of dental issues in the general population. The study was conducted on orthodontic patients from the Department of Orthodontic in Saveetha University. The population attending the hospital was evenly spread across the upper, middle, and lower socioeconomic groups. The educational status of the population was greatly varied. The study was conducted after obtaining clearance from the Scientific Research Board of Saveetha University, Chennai. Informed consent was obtained from each participant before the study. A self-assessed questionnaire was formulated to assess the oral hygiene awareness among orthodontic patients. The questionnaires were pretested to assess its reliability. It was distributed to 100 patients and only completely filled questionnaires were taken for analysis. The study was conducted to assess the oral hygiene awareness among 100 orthodontic patients from the Department of Orthodontics, Saveetha Dental College, Chennai. 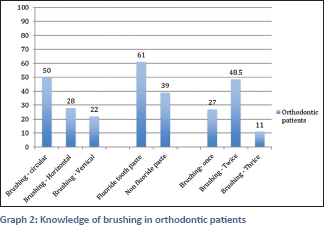 [Graph 1] and [Graph 2] show the orthodontic patient's knowledge regarding brushing of teeth. Circular motions while brushing are followed by 50% of the population, of which 60% are female and 40% are male. Twenty-two percent of the population follow vertical brushing, which is the most effective technique, and 28% follow horizontal brushing. Fluoride toothpaste is essential while brushing to give strength to enamel. Sixty-one percent of the population use fluoride toothpaste, of which 82% are female and 40% are male. While undergoing orthodontic treatment, cleanliness is very important as food particles and debris are prone to accumulate in the brackets. Brushing twice will help keep the orthodontic appliance clean. Seventy-two percent of females maintain their teeth by brushing twice and 20% of females brush thrice a day. Males are not as regular as women in brushing. Only 25% of males brush twice a day and 2% brush thrice a day. With these results, it is clearly seen that females have a better knowledge on brushing than males. Nearly 48.5% of the population follow the criteria of brushing twice a day. 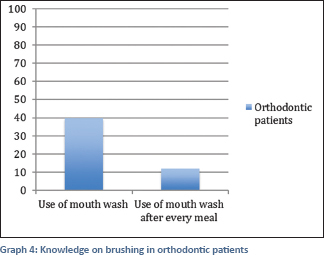 [Graph 3] and [Graph 4] emphasize the patient's knowledge on the use of mouthwash. Mouthwash is an essential component in keeping the oral cavity clean. It kills the bacteria and prevents plaque buildup. About 40% of the population use mouthwash, of which 28% are male and 52% are female. Using mouthwash after every meal has been followed by 12% of the population, in which males and females are 8% and 16%, respectively. 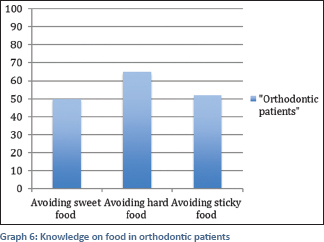 [Graph 5] and [Graph 6] focus on the food habits of the orthodontic patients. It is usually advised not to take hard food to prevent debonding of brackets and sticky food might get stuck in the appliance and tend to accumulate plaque. Thirty-four percent of females and 16% of males avoid sweet food such as cakes and candies. Hard food is avoided by 84% of females and 46% of males. About 70% of females and 34% of males avoid sticky food. Through this chart, it is clear that women exercise greater control over their dietary intake as compared to males. The patients had poor knowledge on brushing strokes and techniques. Circular brush strokes were followed by majority of the patients, about 40% of males and 60% of females. Circular brushing is usually useful in teaching children to brush, but the downside is, it is the least effective brushing technique. The horizontal method is used by 40% of males and 16% of females; however, it is not advisable in the long run because it causes cervical abrasion. Vertical stroke is the most effective brushing stroke as it cleans the interproximal areas and is used in case of fixed orthodontic appliances. 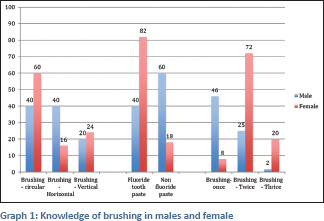 Only 20% of males and 24% of females seem to be using the correct technique of brushing. Plaque can cause gum disease and tooth decay. Fluoride helps prevent tooth decay by strengthening tooth enamel. About 61% of the population are aware of this fact and use fluoride toothpastes, of which 82% are female and 40% are male. Brushing twice is ideal during orthodontic treatment. Forty-eight percent of the population brush twice a day, of which 25% are male and 72% are female. Majority of the men (about 73%) brush only once a day. This result clearly shows that women maintain their hygiene better than men. The results of our study regarding female patients are quite similar to a research done by Ajayi and Azodo,  where 70.4% of females brushed twice a day, 7.4% brushed once a day, and 18.5% brushed thrice a day. The conclusion of Ajayi's result is that females follow proper protocol for brushing. Maintaining good oral hygiene procedures during fixed appliance therapy is important for gingival health and to prevent the development of white spot lesions. While a good brushing technique is important, mouthwashes are often recommended to help control plaque. In this study, 28% of males and 52% of females use mouthwash, which has a combined value of 40%. This value is close to a research done by Baheti and Toshniwal,  in which 57.4% of the population used mouthwash. In the same research, 36% of people used mouthwash after every meal, which is in contrast to our research with 12%. 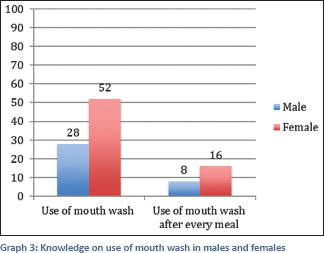 From the above study, it is clearly understood that women understand the usage of mouthwash better compared to men. Evaluating the values of the research, it is clearly understood that women understand the importance of mouth more than men. Hence, women use mouthwash more than men and maintain a better oral hygiene. Sweet food with high sugar content should be avoided whenever possible since it weakens enamel and cause cavities. Thus, the consumption of sweet food should be followed by brushing or mouthwash. In the present study, it is understood that only 50% of the population avoid sweet food. When proper oral hygiene is followed, there is no harm; hence, people should be advised accordingly. Hard foods may cause damage by bending the wires, weakening of cement under the bands, or breaking the brackets. Thus, it should be strictly avoided during orthodontic treatment. Nearly 66% of the population avoid hard food being 46% in men and 86% in women. Sticky food also has the same issues such as bending of wires and weakening of cement. In this research, 52% of the sample avoids sticky food which includes 34% of males and 70% of females. The overall oral hygiene awareness among the patients is poor, but the awareness among females is comparatively better than the males. An average of 44% of the population are aware of the oral hygiene measures. There is a need to incorporate more oral hygiene programs in future. Extra attention should be given in educating and motivating the patients on oral hygiene practices during orthodontic treatment in a proper manner and this could be beneficial in maintaining proper oral hygiene. Nadar S. Oral health knowledge, attitude and practice of patients. IOSR J Dent Med Sci 2015;14:12-5. Bimstein E, Becker A. Malocclusion, orthodontic intervention, and gingival and periodontal health. In: Van dyke TE, editor. Periodontal and Gingival Health and Diseases. London: Martin Dunitz Ltd.; 2001. p. 250-90. Thornberg MJ, Riolo CS, Bayirli B, Riolo ML, Van Tubergen EA, Kulbersh R. Periodontal pathogen levels in adolescents before, during, and after fixed orthodontic appliance therapy. Am J Orthod Dentofacial Orthop 2009;135:95-8. Krishnan V, Ambili R, Davidovitch Z, Murphy NC. Gingiva and orthodontic treatment. Semin Orthod 2007;13:257-71. Maticì S, Ivanovicì M, Mandicì J, Nikolicì P. Possibilities to prevent gingivitis during fixed orthodontic appliance therapy. Stom Glas S 2008;55:122-32. Becker A, Shapira J, Chaushu S. Orthodontic treatment for disabled children - A survey of patient and appliance management. J Orthod 2001;28:39-44. Ajayi EO, Azodo CC. Oral hygiene status among orthodontic patients. Benin city, Nigeria: University of Benin; 2014. Baheti MJ, Toshniwal NG. Survey on Oral Hygiene Protocols among Orthodontic Correction Seeking Individuals. Pravara Institute of Medical Sciences; 20 April, 2016.